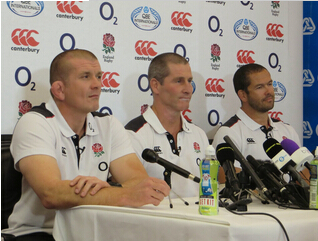 The England Rugby EPS squad announcement day is always a big day, after weeks of anticipation and players sticking their hands up for selection the 4 men at the helm of our elite game make their choices and announce them to the world’s media. Yesterday Stuart announced the 33 man squad for the QBE Internationals at QBE’s Head Office and following the live broadcast he spoke openly to the press regarding the decisions that he and his team had made giving us a true insight into their decision making. The overall message from the England team was clear, consistency is king and it is evident for us all to see from their selection decisions and justifications that they are demanding a lot from our country’s elite players. Now, in 2014 to be in with a shot of playing for your country you have to truly be world class, on all fronts, week in and week out and deliver more than ever before due to the competition around you. After one final European hoorah it is time for the coaching team to get their hands on their players and that is something they can’t wait to do before the colossal task of hosting the best of the Southern Hemisphere at home in just over 2 weeks time.